Every culture usually has one food that we would not consider eating in Canada, and in this part of Japan, it’s horse. Raw horse to be precise. 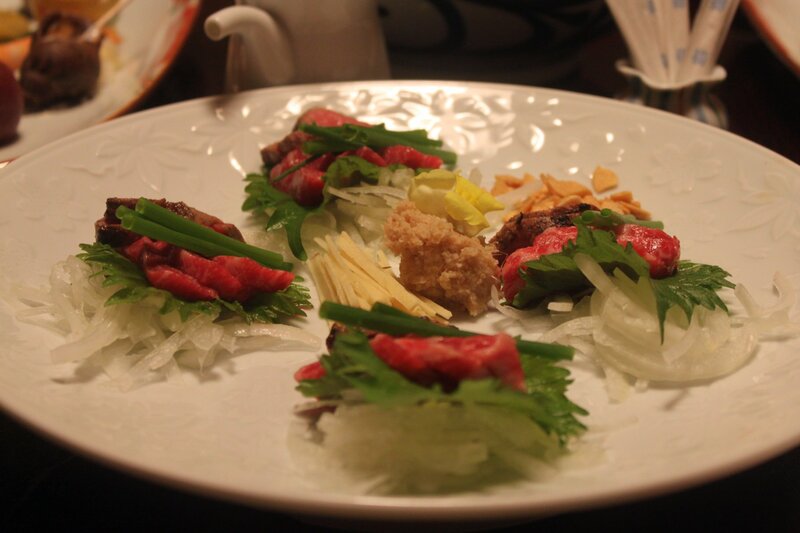 Basashi, as they call it, is raw or slightly grilled horse and is a specialty of the prefecture beneath Fukuoka, Kumamoto. I’ve seen it served at fancy restaurants, not so fancy restaurants and even people’s houses, and it weirds me out a little every time. What weirded me out even more though, was how much I liked it. Japan's weird food: extremely expensive fruits. 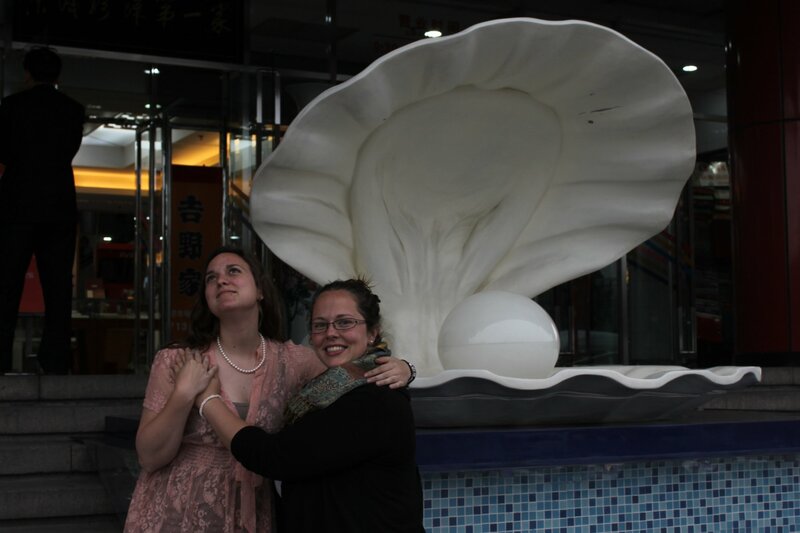 Alicia and I show off some of our purchases from the Pearl Market in Beijing. 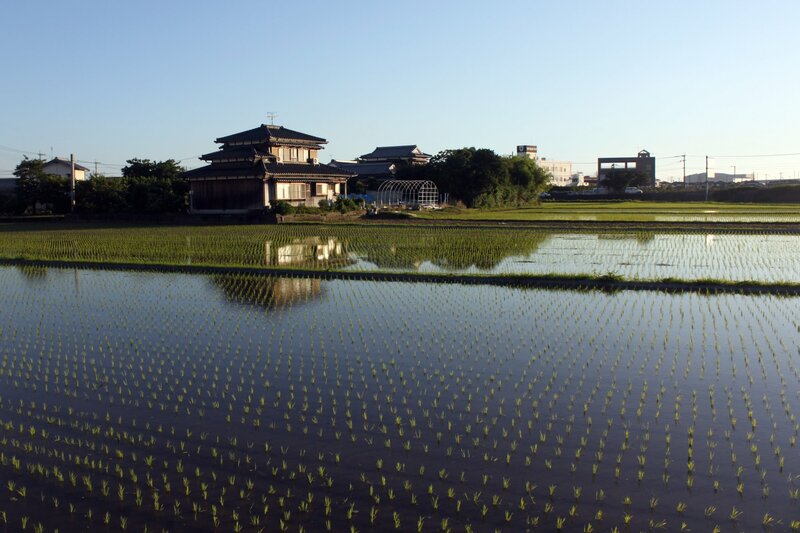 They call this season Tsuyu – the rainy season. Today, at 8:30, it was already 29°C with a relative humidity of 78%. After ten minutes of cycling, and ten minutes of pushing my bike up a steep hill, I made it inside my school, where it is also 29°C with a relative humidity of 78%. No relief there. I have started leaving the air conditioner on in my apartment during the day to reduce the humidity and prevent invasions of bugs and mold. Yesterday I found mold on a nail polish bottle in my bedroom. It’s out of control. Despite the overheating complaints, Japan is exceptionally beautiful during rainy season. The rice fields around my house are being planted this week, and every day I see farmers out tilling and planting. The spring flowers are still blooming and new ones are appearing every day. I shouldn’t complain, because I know the moment I come back to Canada and experience the winter’s chill, I’ll miss Japan, bizarre climate and all. *Note: They do have air conditioning in the staff room and some, not mine, classrooms, but there is a rule about not turning it on until July. Even when they do turn it on, it’s nothing like we are used to in North America. 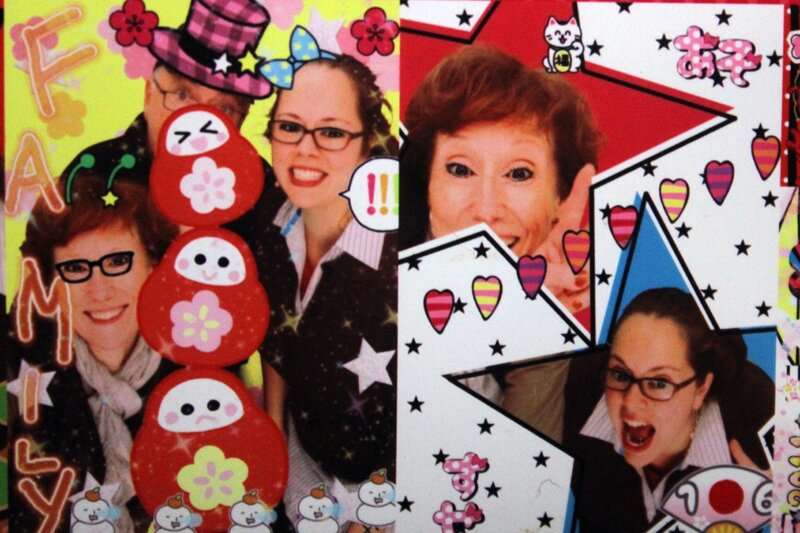 Purikura, or Print Club, is an extreme photo booth experience popular with high school girls and with me. Almost every girl in my school has purikura photos stuck all over their pencil cases, binders and even their rulers. 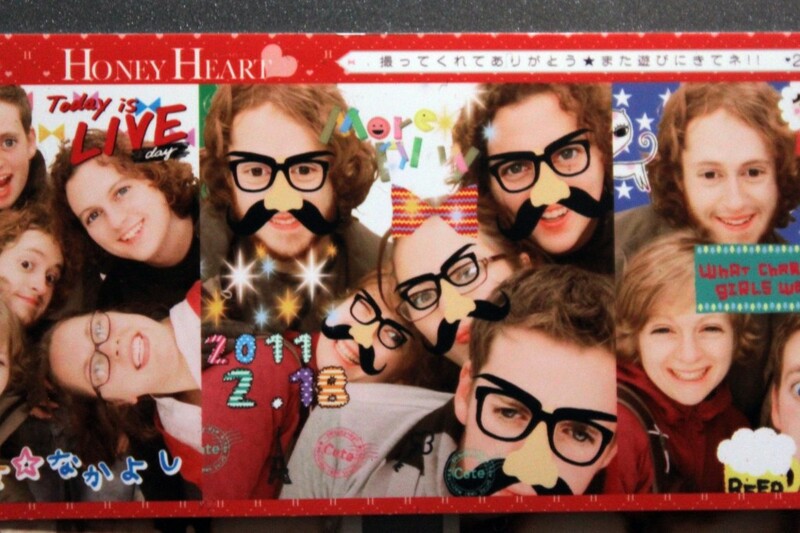 Arcades, shopping malls, and even the dollar store have purikura booths and I have easily become addicted. After you enter the booth, and deposit your 400 yen, you are given the option of making your skin darker, your eyes sparklier, and choosing the background. Each of these decisions is stressful, as the screen is in Japanese, and you are given a short time to make your choice. After taking your photos in front of a green screen, you can add writing, pictures, make up, accessories and hilarious english phrases to your pictures. 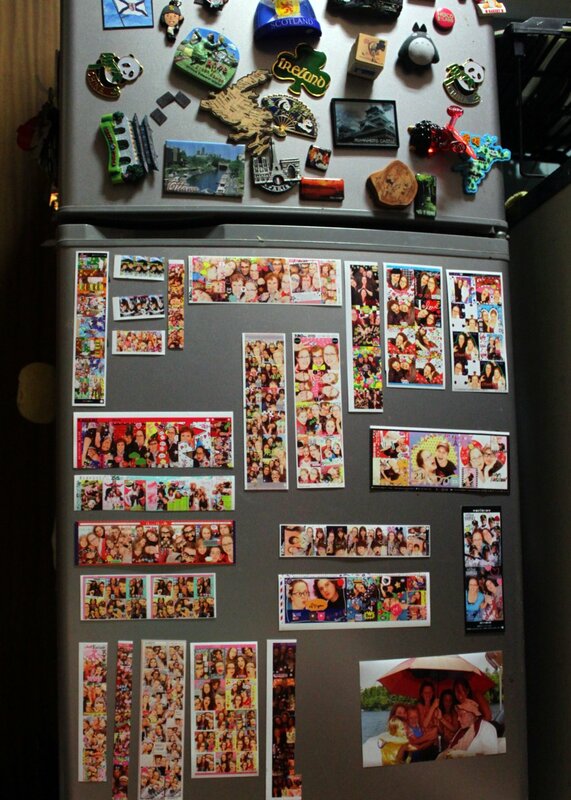 The pictures are printed off as stickers, and you can also send them to your cellphone, or add them to a display book on the machine. 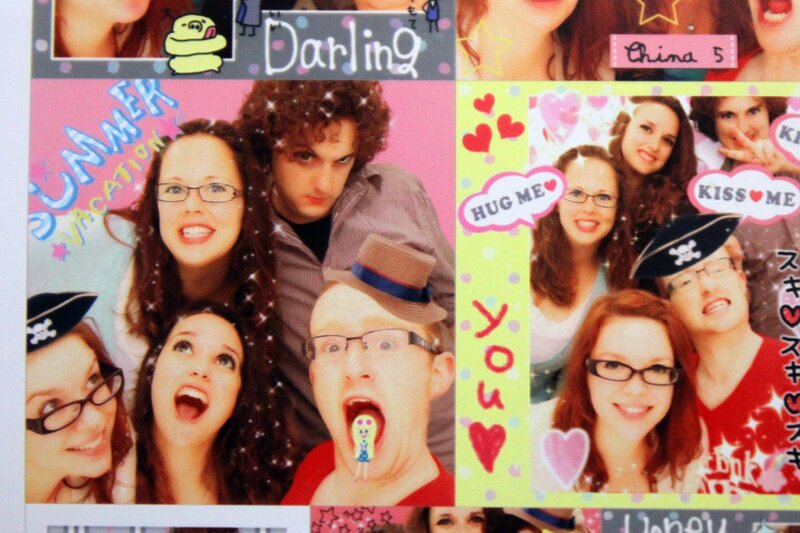 I love Purikura and often coerce my friends into going with me so I can add to my excellent collection. While I know there are a few booths in Canada, and it’s popular in other Asian countries, regular Purikura is definitely an activity I will miss when leave Japan. However, it’s so ridiculous and Japanese, that it doesn’t really belong anywhere else. One of the side goals of the JET programme is ‘grassroots internationalization’, a phrase I have heard so often this year I forgot it wasn’t a thing that people elsewhere said. 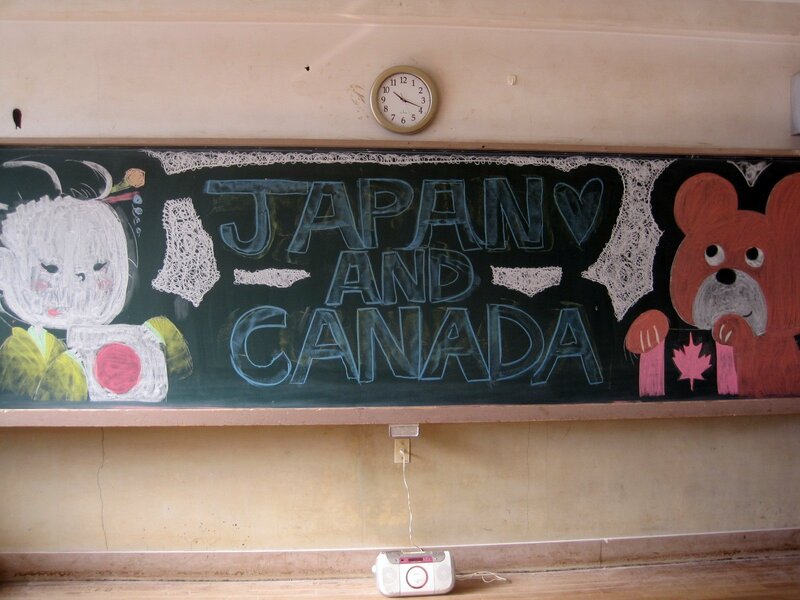 Regardless of any slang I picked up, interacting with students and the community and teaching them a little about Canada was one of my favourite parts of living in Japan. While I am not sure that they understand what poutine is, or that it’s not cold in Canada all the time, at least they can accurately draw our flag, which is more than I can say for many Canadian students, or me. I held a quiz this morning and the students could tell me that the most famous sport in Canada was ‘ice hockey’ and that the most famous food was ‘mapalru syrupu’, and that the capital was Ottawa. Of course, they also know that Avirl Lavigne and Justin Bieber are from Canada, and I think that endears them to the country more than I ever could. It was my last class with the second year students, and I am going to miss them a lot. 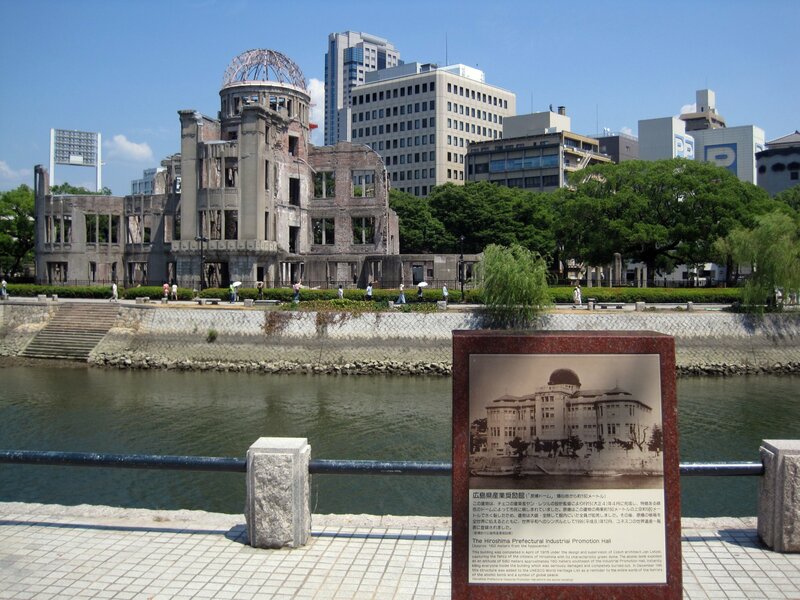 The Genbaku dome was left mostly intact after the bombing of Hiroshima, and is preserved as a poignant memorial.